Ex-cop Rolando Mendoza, who took tourists hostage last year to protest charges of extortion, which he said were used to extort money from him, actually was an extortionist, says the Court of Appeals. In a 19-page decision, penned by Associate Justice Francisco Acosta, the CA’s Thirteenth Division, eventually cleared the names of (former ombudsman Merceditas) Gutierrez and (former deputy ombudsman Emilio) Gonzalez after it affirmed their ruling that Mendoza, who was killed during the hostage-taking, and his men were indeed “extortionists” which warranted their dismissal from the service. The appellate court has junked the petition for review filed by petitioners Mendoza, P/ Insp. Nelson Lagasca, SPO1 Nestor David, PO3 Wilson Gavino and PO2 Roderick Lopeña. 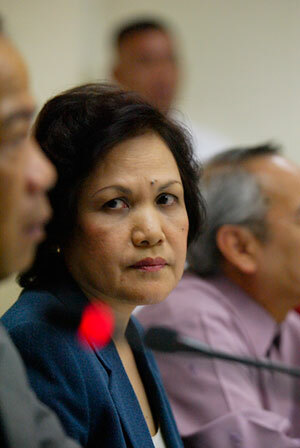 Mendoza insisted he was innocent (of extortion, at least) and that his dismissal from the service was unjust. He was killed in a failed rescue attempt that night. Gonzalez lost his job after the incident for supposedly delaying action on Mendoza’s appeal and for supposedly trying to extort P150,000 from the dismissed cop. Now, this development doesn’t mean Gonzalez didn’t try to extort money from Mendoza but it does sort of demolish the narrative that Mendoza was an honest man forced by a corrupt system to take over a bus of tourists to protest that corrupt system. Mendoza was, apparently, dismissed from the service for cause. Gonzalez was removed over, in the end, nothing. The appellate court ruled that the Office of the Ombudsman was correct in ruling that Mendoza and their men should be sacked from the PNP roster. “Besides, questions remain unanswered: We could not understand why the petitioners extendedly kept or detained Kalaw in the police station when the purported basis was just a mere traffic violation, i.e., illegal parking and/or driving without required license; and why the petitioners put so much attention on Kalaw’s alleged traffic violations when primarily it is their job to apprehend traffic violators in the City of Manila,” the decision stated. Gutierrez resigned as ombudsman in March after she was impeached by the House of Representatives for her supposed lack of action on corruption cases, especially those concerning former president Gloria Macapagal-Arroyo. Gutierrez defended and cleared Gonzalez of any wrongdoing. Well...this is awkward, isn't it?